UPDATE AUG 27th – ALL colours apart from Limelight and BAF Yellow are now being made and will be in stock in approx 2 weeks. 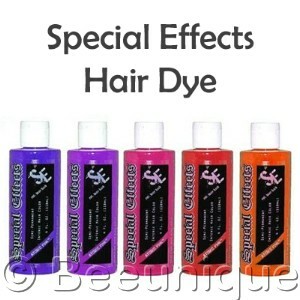 Its’s taken months but we finally have some update on Special Effects Hair Dye Delivery! They are now shipping 13 colours from their range with a promise that another 9 will be available next month! As most of you know the special effects hair dye delivery has been erratic since their premises move back in 2016, but now they are finally producing some more of their great colours. These additonal shades will be in stock next month! Available colours are: Joyride, Napalm Orange, Wildflower, Blue Mayhem, Cherry Bomb, Atomic Pink, Electric Blue, Nuclear Red, Deep Purple, Blood Red, Virgin Rose, Pimpin Purple & Cupcake Pink. – we will update on a delivery date once we receive confirmation they have been shipped. As with ALL products on Beeunique you can sign up for a ‘Back In Stock’ notification and you will be emailed as soon as the product is back in stock. We are against all types of spam so your email will only be used for this one notification and then discarded.